A few weeks back, me and my family visited the newly opened restaurant, Bistro Nineteen86, in the heart of Halifax Town centre. The bistro is located on George Street, just around the corner from the beloved Yates. It’s the perfect location to start or even finish your evening out. Bistro Nineteen86 is a family run business, who gave us the warmest welcome. The bistro serves fresh Modern-European food using the best ingredients Yorkshire has to offer. The restaurant isn’t huge, but has a lovely bar area where you are able to just go in and have a few drinks if you aren’t hungry. They have an amazing selection of wines, lager and spirits, so the perfect place to begin your night. The only think I would say is that, they could do with frosting over the windows a little more as it is very open, therefore very well lit, however it is a huge reminder that you are still in Halifax haha! My sister also got to see a little too much of a group of lads in the alleyway opposite. However, the food, drink and hosting were outstanding, so therefore the open windows weren’t off putting and we shall 100% be returning. Chicken liver parfait, Foie Gras bon bon, pear and red onion compote, toasted ciabatta. To start with I got the chicken liver parfait which came with a Foie Gras bon bon, pear and red onion compote and toasted ciabatta. This was the first time I have ate out and order parfait and got the right balance of parfait and bread. You usually get a huge amount of parfait and no bread, but this was perfect. The parfait was rich, smooth and packed full of flavour, and the chutney was an amazing accompaniment. Plus, the foie gras bon bon was a lovely addition to the dish. My Dad had the Cider Braised Pig cheek with truffled Swede puree, leeks and crackling. The pig’s cheeks were cooked to perfection and melted in the mouth, a super tasty starter. My sister had the crispy baby squid rings with aioli, which looked amazing plus they were gone in seconds, so they must have been good. And finally, my Mum decided to go for the Scallops with Boudin Noir, Saffron Cauliflower Puree, Parma Ham, which gave me serious food envy. These were cooked fabulously, as there is nothing worse than an overcooked scallop. My mum said she really enjoyed it. ‘Land and Sea,’ Aged Fillet of Beef, Butter Poached Lobster Tail, Pomme Puree, Roast Shallots, Rosemary Scented Jus. 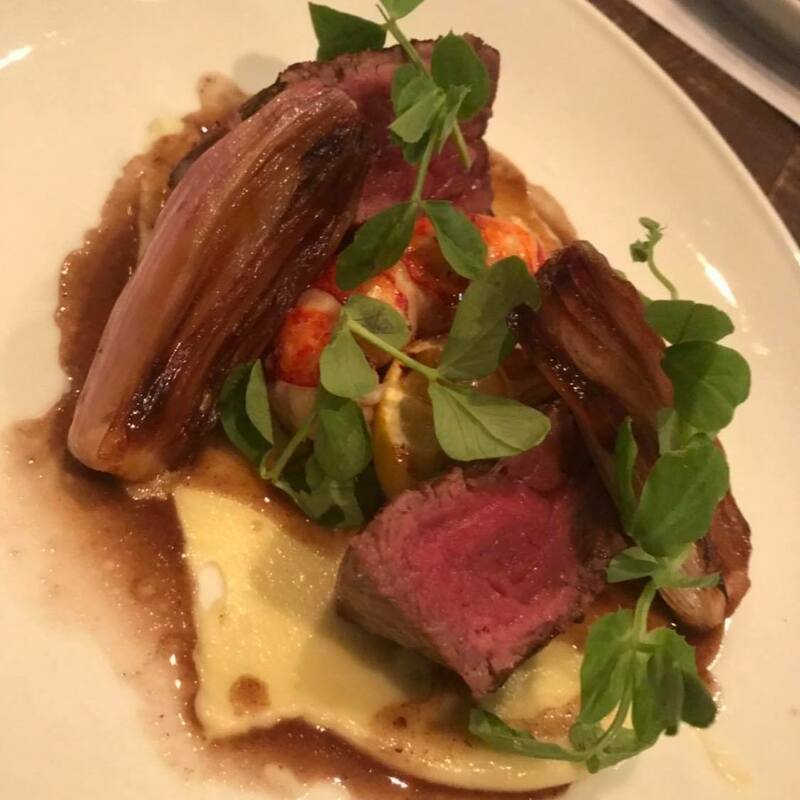 For mains me and my sister got the same, ‘Land and Sea,’ Aged Fillet of Beef, Butter Poached Lobster Tail, Pomme Puree, Roast Shallots, and a Rosemary Scented Jus. It was as good as it sounds, the beef was cooked to perfection and so was the lobster. I also got a side of peppercorn sauce which went great with the steak. The portions were just big enough, however with some of their dishes you may want to get a side of chips to share. My mum went for the Roasted Cannon of Lamb, Minted Pea Croquette, Carrot Puree, Asparagus Tips, served with a Lamb Jus. She said the lamb was well cooked, and overall a very tasty dish, as well as my dads dish, who opted for the Pan-Fried Venison Loin, Celeriac Puree, Roast Baby Roots, with a Juniper Jus. Their dishes clearly celebrated great Yorkshire produce, which is great to see in the heart of Halifax. By the time I had ate my starter and licked my plate clean from my main, I was too full for a dessert so opted for a glass of gin fizz instead. This was deffo the better option as me and my sister went straight out round town afterwards. I would highly recommend you all go and give this lovely little bistro a go! They are now opening Sundays and their Valentines menu looks amazing! Go check them out and get a table booked for this weekend – you won’t be dissapointed. I hope you enjoyed another review and let me know your opinions Bistro Nineteen86 or any other places you think I should visit, in the comments below!